It’s incredibly easy to overestimate the benefits of technology in healthcare. However, the average nurse-to-patient ratio in hospitals presents a challenge that IT managers can take a proactive role in addressing by rethinking a core component of their mobile strategy. IT leadership has an emerging opportunity here to directly address this issue with the implementation of unlocked smartphones for nurses at all levels. It will be critical though, to go beyond an understanding of the tech alone and delve into the challenges that nurses face, directly involving nurse leadership in any decision-making situations. Healthcare organizations face multifaceted pressures in response to keeping nursing metrics at acceptable levels. States across the nation, including California, Texas, Illinois and New York have either enacted legislation or adopted regulations requiring facilities to maintain specific staffing levels. At the same time, that pressure is compounded by an impending shortage of registered nurses (RNs) that is only expected to become more severe as baby boomers’ healthcare needs increase. To further complicate the issue, the schools that produce nurses are struggling to expand their capacities to meet demand. These dynamics mean that not only do facilities need to optimize the effectiveness of their current nursing staff, they’re incentivized to ensure the well-being and continued productivity of their existing professionals. How Can Unlocked Phones Boost Productivity? Discover the benefits unlocked phones offer a variety of industries. To understand why unlocking phones matters, it’s important to first grasp how smartphones in general enhance nurse communications. Smartphones hold significant potential to improve the efficiency of nurse communications and workflows, and thereby minimize the impact of the low average nurse-to-patient ratio in hospitals. First off, the use of smartphones by nurses is already happening. According to MobiHealthNews, a survey conducted by market intelligence firm InCrowd revealed that 95 percent of the 241 responding nurses owned a smartphone, and 88 percent were using them at work — and not just for the sake of convenience. Nurses are using their phones in ways that directly impact care — 52 percent indicated that they use apps on their phones to access information (instead of asking colleagues), and a full 32 percent indicated that they consult their smartphones instead of a physician. It’s worth noting that nurses need different functionality from their smartphones than doctors, specifically in quickly accessing information, supporting workflows and setting timers for medication administration. Smartphones also allow nurses to streamline communication through secure voice, text messaging, email and video conferencing options, giving them the ability to contact their team members in real time. The easily accessible nature of smartphones opens the door to immediate notification of a patient condition, meaning individual nurses can respond more quickly or redirect the emergency to the proper team members if necessary. Most importantly though, smartphones can improve patient engagement by opening the door to more fluid communications at the patient bedside. 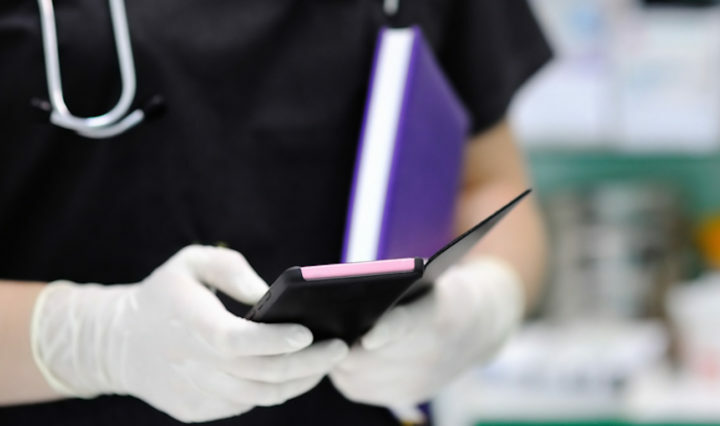 Nurses can back away from the practice of handing over a thick stack of papers and instead use their phones to supplement patient engagement right at the moment of care. Smartphones revolutionize the way clinical staff communicate and interact, but when they’re unlocked, the very nature of how the phone fits into the hospital IT environment changes. Any hospital with a mobile strategy that prioritizes efficiency, flexibility and cost maintenance should consider unlocked smartphones for their device fleet. Unlocked devices provide critical standardization across an organization, which opens the door to more sophisticated security options that will only increase in value as cybersecurity threats continue to plague the healthcare sector. Unlocked smartphones also end carrier dependence, so they can be deployed for use on existing Wi-Fi connections, removing the expense of a carrier plan. Nurses can then be granted the ability to access a broader range of Android apps, EHR-connected solutions and even proprietary software options with unlocked phones. The first steps in positively influencing the average nurse-to-patient ratio in hospitals are understanding measurement and determining target ratios based on regulatory requirements and historic outcomes. Adaptation: Nurses have likely developed their own processes and workarounds using legacy devices. New smartphones will require active conversations and training to help nursing staff adapt as quickly as possible. Mobile app use: Since staff will have access to an entirely new world of apps, it will be crucial to develop and communicate standards and safeguards around app access and use. Individual empowerment: More sophisticated devices mean increased empowerment for professionals and a better overall work experience. The possibilities of improving nurse retention and satisfaction levels with the help of feedback and monitoring apps shouldn’t be ignored. When launching an unlocked device program targeted toward nurse support, it’s important not only to consult leadership, but also to be mindful of security risks and their possible impact on patient care. Continual, open conversations with the nurses on the front line of patient care will be the key to any successful device program. Most importantly though, ITDMs should look at unlocked smartphones as a step toward a connected framework for the hospital of the future.